Today I woke up and ate hot cross buns and chocolate. I went to the fish market and ate salt and pepper calamari and lay in the grass with Mr G but I didn’t photograph any of it because it was all eaten too quickly and we were having too much fun to think of documenting it. At some point though, I did get a little bit crafty, and a little bit thrifty, and put some quotes in a pair of lovely gilt frames I found at St Vinnies for $5 each. You probably can’t read it. 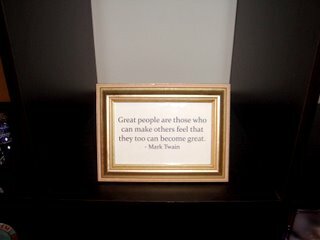 It says “Great people are those who can make others feel that they too can become great – Mark Twain”. It reminds me that you’re not a sap just because you’re a nice person. 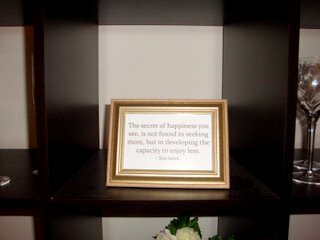 This one says “The secret of happiness you see, is not found in seeking more, but in developing the capacity to enjoy less – Socrates”. It is the declutterers mantra. Here’s a picture of the frame in the context of my bookshelf. I admit, I was one of those people who thought Ikea’s Expedit was revolutionary at the time. Not so much now, but it’s still good for little vignettes of your life. 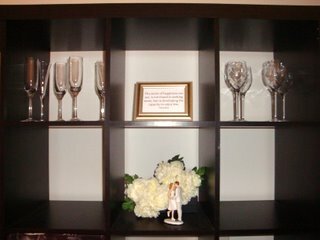 The champagne flutes are Villeroy and Boch and a very nice wedding present. The white wine glasses are by someone Italian and were also a gorgeous wedding present. I don’t save any of these for ‘good’. When I have friends over, lead crystal is thrust straight into their hands in spite of their protests. The porcelain couple was the wedding cake topper, and the fake ranunculus flowers (can you believe it?) were going to be my bouquet until I stupidly let my mother talk me out of it and into real flowers. My real bouquet was ugly as sin and an excellent lesson in standing ones ground. Fortunately I attacked it with a pair of scissors until it was presentable. The fake silk flowers were ten times more beautiful. I can’t complain, because they’re still beautiful! 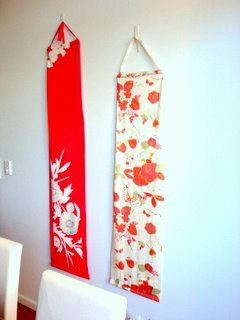 These are a pair of wall hangings I made from some Japanese kimono fabric. There is tons of it on Ebay and not very expensive. You simply get some dowel from Bunnings, ask them to cut it to size, then hem each end of the fabric leaving enough room for the dowel then poke that through. Poke some ribbon through with it so you can hang them, and voila, thrifty home decor! I am all about the thrift. When you’re a 31 year old career changer who is now back in full time study and, well, poor, you perhaps tend to feel it a bit more keenly than your average 19 year old whose friends are all in it with them, and are probably living it home. It’s made harder by the fact that my new profession involves seeing a lot of heartbreak on a daily basis. Buying flowers is a little frivolous, but as a mentor in the profession wisely told me, sometimes you just have to colour the edges a little. 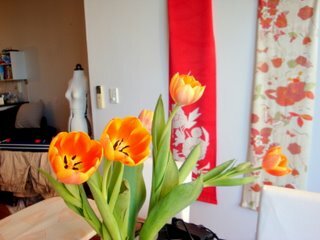 My tulips coloured the edges beautifully. And I love this photo, the kitchen table is a mess, there’s general chaos, but there’s lots of colour and joy too. It sums up my life right now.